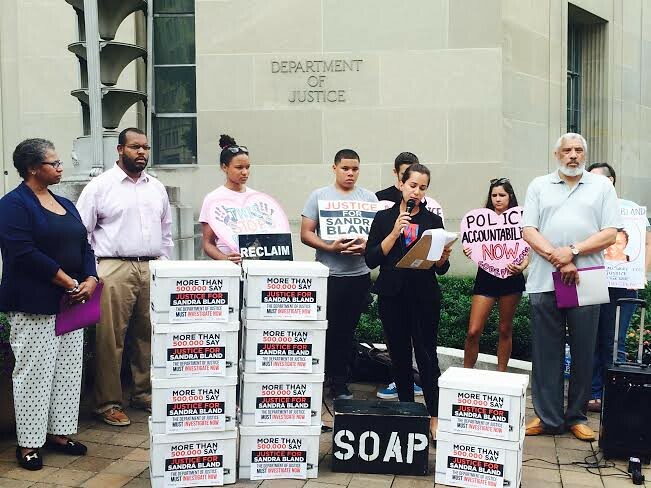 Yesterday we joined MomsRising, ColorofChange, MoveOn, Ultraviolet, and others to deliver over 500,000 petition signatures, including yours, to the Department of Justice calling for a thorough investigation into the death of Sandra Bland. Someone from the DoJ came out to accept the signatures and heard our voices – and our outrage. Horrifyingly, Bland's tragic death is a part of a pattern of brutality against women of color. In just the month of July, five women of color have all been found dead in their cells after being arrested by local authorities: Sandra Bland, Kindra Chapman, Joyce Curnell, Ralkina Jones and Raynette Turner. With the anniversary of Michael Brown’s murder coming up on August 9th, stay tuned for actions you can take in your community. Even though we brought the voices of over half a million people to the doorstep of the Justice Department, we still have a lot of work to do for police accountability and an end to racial profiling and police brutality. We hope you will spread the word and stay involved.